The Chinese have created some of the best-tasting dishes we still enjoy today. And Mandarin Palace tops the restaurants in the Metro South that serves these authentic Chinese cuisines that you absolutely got to try. Mandarin Palace offers well-prepared food that has texture, aroma and exquisite flavors that suit any discerning palette. We were given a pot of tea as soon as we sat down. For dimsum, I had Hakaw (Shrimp Dumplings, P 128) and Siomai (open-topped Steamed Shrimp Dumplings, P 88). The Siomai was dense and chewy the way I like it. These two dimsums are definitely good to blow your cash on. My other two favorites were the Fried Shrimp Rolls with Almonds plus the roasted Peking Duck (P 1,500 served whole, 2-way). 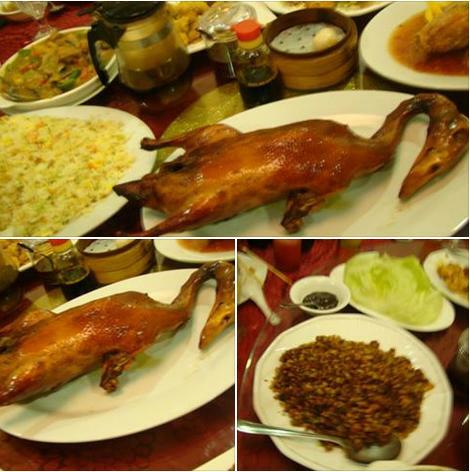 Peking duck is a famous dish from Beijing savored for its perfectly-browned, crispy skin and aromatic meat. It is usually sliced thinly and eaten wrapped in flat bread. For a bit more flair, you can have it minced and eaten wrapped in lettuce with Hoisin Sauce on the side (best lettuce wraps ever). We were also served King Fish in Mango Sauce, Salt and Pepper Spareribs (P 600, large serving) and Deep fried Seafood Roll (P 500, large serving). Though these dishes were fried, it was not greasy. Layers of texture and flavor were imminent in the last two. King Fish in Mango Sauce is an intriguing combination of crispy fried fish served with a sauce using ripe mango slivers and greens. The sweet dressing works its way into the crunchy fish meat making it more savory. Deep fried Seafood Roll is crunchy on the outside. I love the flavor these seafood-stuffed rolls make. It has that sweet tang that bites through it thick golden crust. The Salt and Pepper Spareribs is uncomplicated strips of tender pork ribs with a hint of spiciness. I love it! Braised Chicken with Curry Sauce is a good way to introduce curry to kids. This chicken dish has a very subtle hint of curry taste. Mandarin Palace also takes Chinese cooking in new directions with modern twists. I got to taste a few of which have their own original touches. Fried Squid in Salted Egg is crispy battered and fried squid mixed with salted egg. This is something I would highly recommend. Mandarin Palace takes rare but flavorful ingredients, such as pigeons and frogs to create refreshing meals. We asked for their Fried Frog Legs to get curiosity out of the way. There is not much meat on them but it tasted like chicken. For dessert, I had Mango Sago. Chunks of ripened mango enrobed in thick mango cream and sago (tapioca) makes a light, refreshing cold dessert. Mandarin Palace has been around for three years. When your urge to have Chinese food strikes, get it from Mandarin Palace. If you want to taste their claim to fame, you got to order their dimsum and Peking Duck. 142 Aguirre Avenue, BF Homes, Parañaque City. Dimsum and Chinese food never fail to make my tummy smile. This restaurant in Parañaque looks promising. Do they have any branches elsewhere? No, they don't. The Parañaque restaurant is their flagship venture. Well, I love all these Chinese foods in the table. Dimsum, dumplings or another term for that matter, as long as Chinese cuisine. Mandarin Palace has it all! I love Peking Duck and the many ways of preparing them. They have really great Chinese food here.